Cut one 14” x 14” (35cm x 35cm) square from a solid fabric of your choice – this will be the front of you cushion. Cut two 10” x 14” (25cm x 35cm) rectangles of Liberty Lifestyle patterned cotton – these will form the contrasting envelope closure (back) of your cushion. Set aside the 14” x 14” (35cm x 35cm) cushion front and two 10” x 14” (25cm x 35cm) rectangles for now, and begin preparing the fabric for your appliqué. Trace the appropriate number of pattern pieces from the templates provided in your pattern on the paper side of your fusible webbing and cut them out. One side of the webbing is a very thin web of heat sensitive glue, the other side is a paper that can be drawn on easily – it is transparent enough to see through and trace your pattern pieces with a pencil or pen. When you have finished tracing the pattern pieces onto the fusible webbing cut out all of your shapes and use a hot steamy iron to adhere them to the WRONG SIDE (BACK) of the corresponding fabrics. Make sure your iron is on the “cotton / linen” setting and set it so that there is plenty of steam. Do not peel the paper backing from the appliqué pieces until you have fused them onto your fabric. It is much easier to handle the appliqué pattern pieces when they still have the paper backing in place. 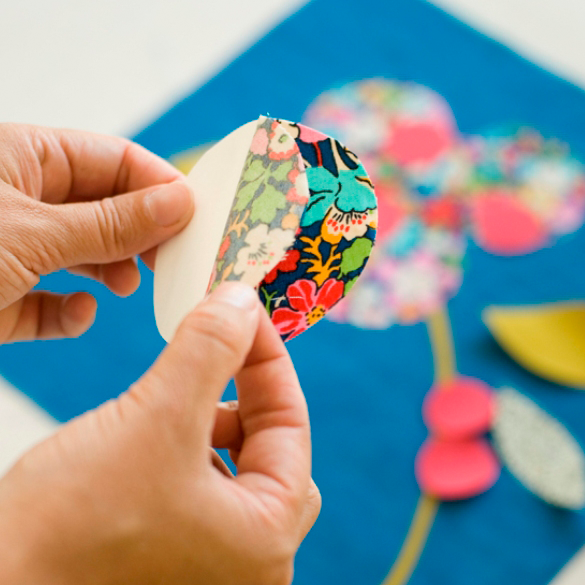 When you have ironed your shapes in place on your fabrics, carefully cut the shapes out around the perimeter of the paper, and peel off the paper backing. After you remove the paper, there will be a very thin layer of heat sensitive glue remaining on the fabric. Next, following the guidelines on your pattern image, place your cut out pattern pieces onto your 14” x 14” (35cm x 35cm) cushion front. 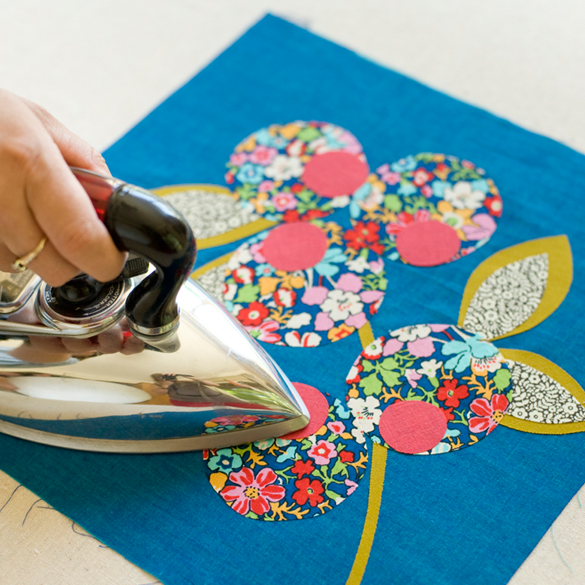 When you have everything where it should be, use your iron to slowly set all in place onto front of your cushion. The heat from the iron will fuse your appliqué pieces to your cushion front and eliminates the need for pins. To prevent the edges of your appliqué pieces from fraying, sew around each individual appliqué piece with a tight zigzag stitch. Each sewing machine is different so you will have to adjust your machine’s stitch settings, varying the width and length of your zigzag stitch. Adjust you machine until you have a zigzag that is the width you like, with a short stitch length so that the stitching is nice and tight and will stop the fabric from fraying. Centre the stitch over the outer edge of your appliqués and simply sew around the perimeter of each piece. I strongly suggest using a thread that is the same colour as the appliqué piece. It will hide flaws and make your finished cushion look much cleaner and professional. Since you are using all curves in this pattern, take the time to cut out an extra a circle, and practice your stitching on a scrap piece of fabric- you will be very happy that you did! When you have finished zigzag stitching around the perimeter of all of your appliqué pieces give your finished cushion front a good press with the iron and set it aside. Now begin work on the two 10” x 14” (25cm x 35cm) rectangles of the contrasting Liberty Lifestyle print fabric that will make up the envelope closure (BACK) of your cushion. On each of the rectangles, fold over and press a 1/2” (1.5cm) seam, and then fold over and press again, pinning into place. Run a straight stitch with your sewing machine through the centre of the fold creating a finished edge. Repeat on both pieces of fabric. When you have sewn finished edges onto both 10” x 14” (25cm x 35cm) rectangles that make up the back of your cushion, place them RIGHT side down on top of your finished appliqué cushion FRONT. The right sides should be square and the seams of the envelope closure overlap. Pin all sides of your project together and sew around the edge of your cushion using a straight stitch and 1/2” (1.5cm) seam allowance. When you have sewn all sides of your cushion together remove all of the pins, turn your pillow right side out and press until it is flat and crisp. You can now open the “envelope” that was formed at the back of your pillow by the overlapping rectangles and place your cushion insert inside.